On the eve of the start of the 2012 Clausura here are my thoughts on each team’s chances in the championship and all the transfer ins and outs to the best of my knowledge. For a re-cap on the Apertura be sure to check the table and the team of the season. Tomorrow (Saturday) I’ll have the standard game-by-game preview of Week 1. The defending champions are probably favourites to reclaim the trophy considering they are the only major side to hold onto their manager. They have lost a key player from the title win in Edgar ‘Pajaro’ Benítez but have got quality on board at both ends of the pitch with veteran Carlos Bonet and Uruguayan Gonzalo Viera joining the defence with the latter’s compatriot Roro López and Argentine Germán Alemanno welcomed up front. 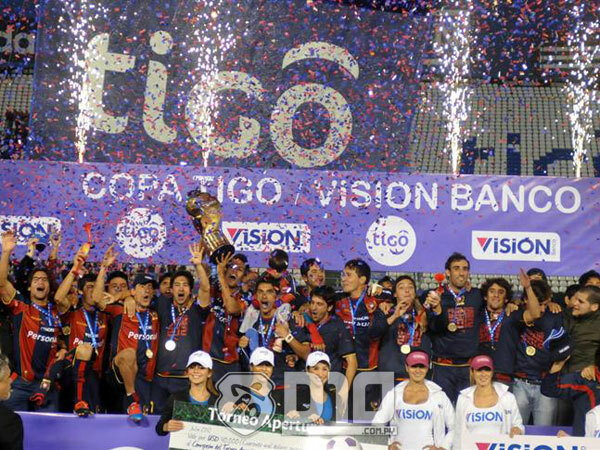 Having already qualified for the Copa Libertadores the league campaign will be put onto the back burner if they progress past the early stages of the Copa Sudamericana, otherwise it could well be consecutive championships. Runners-up in the Apertura having led by seven points the slump in form came after three key players were sacked, Sergio Orteman, Vladimir Marín and Adrian Romero. Olimpia have now lost their coach to the national team and their main two strikers from the Apertura campaign to European football. The positives are that they snatched Fredy Bareiro who was topscorer in last year’s Clausura with Cerro Porteño plus a series of strong replacements including Juan Manuel Salgueiro from San Lorenzo. They have also employed the very astute Uruguayan Gregorio Perez as manager having been successful in Paraguay with Libertad (and previously managed Olimpia too). However with so many changes and the distraction of the Sudamericana, and the problem of having too many foreigners (only 4 of their 7 can play) a league trophy seems unlikely. The aurinegro have been active in the transfer market snapping up Sergio Orteman who will form a strong partnership in central midfield with compatriot Marcelo Palau. However the loss of Julio Manzur in defence further exposes them and without a top class striker it is unlikely new boss Diego Alonso can do more than his predecessor and get anywhere close to top three. Their recent defeat at home to Bolivian side Oriente Petrolero was a case in point of their need for a clinical goalscorer. There has been an exodus at Libertad, Jorge Burruchaga left along with most of the Argentine contingent but that pales into insignificance with the home-grown players that have left. Víctor Cáceres and Carlos Bonet were pillars of the Gumarelo’s recent league success, Pedro Sarabia stays on at the club as assisstant to new manager Rubén Israel. In theory Libertad should have been favourites to win the Clausura with Olimpia and Cerro in the Sudamericana but with so many changes and such a short close-season it seems unlikley the new team will be able to gel properly in the 22-game season to take the league. A decent Apertura considering the Copa Libertadores and managerial change but La Academia have lost a few key players, notably Ariel Bogado their topscorer and Gustavo Cristaldo who was on fire towards the end of the Apertura. The departures of three first team defenders will be a blow too with little cover and rumours that Marcos Miers may be moving abroad too. Could be a tough season. Another clean-out at Luque including the backroom staff with Pablo Caballero replacing Carlos Kiese. The losses of Pablo Aguilar and Ronald Huth certainly weaken the back line while the departure of Roberto Gamarra would have reduced offensive potential if it wasn’t for a similar replacement in Nestor Ayala. With Luque the pressures are off the pitch, a whole city and fierce barra are baying for results to make sure they don’t drop down a division. Things can’t be as bad as last year, the albiverde started with back-t0-back wins then fell into a horrible slump they never really recovered from, only avoiding a last-place finish thanks to the truly terrible Tacuary. Chiqui Arce is back at the helm after a stint as national team manager and he has made some shrewd signings and will be boosted by Nery Cardozo’s return from Norway. Derlis Gonzalez is now at Benfica which will mean they lose some pace in attack but overall they should improve on the Apertura. No doubt that the big loss is José Ortigoza but Sol de América have recruited well in getting Alfred Mazacotte from Tacuary to help cover other losses in midfield, they boast the most exciting young strike force in Paraguay with Enzo Prono (21), Cecilio Dominguez (17), Diego Vazquez (20) and 23-year-old ‘veteran’ Lorenzo Frutos. The key will be to tighten up the defence with goals unlikely to flow as freely as the Apertura. A terrible Apertura campaign but the side have been boosted for the Copa Sudamericana with Reinaldo Ocampo and Ramón Cardozo hopefully adding a bit more attacking spark. Defensively they looked better towards the end of the year especially when Gregor Aguayo returned from his six month ban. As ever they will set up as hard to beat and try and nick goals where they can. Alicio Solalinde got the team playing some good football before departing in June, the onus is now on Carlos Jara Saguier to try and keep that going although two of their main attacking threats have left, Francisco García and Imanol Iriberri. The club will be playing with less pressure than those around them who are closer to relegation which could have a positive effect as they typically enjoy expansive football. A very good Apertura has given the Primera’s sole representative from Alto Parana a real chance of staying in the top division. Eduardo Rivera got the team well organised and were defensive in the first part of the year before blossoming in the latter part of the season, aided by eight goals from Rogerio Leichtweis. Mario Jacquet went on a great run with Carapeguá when he first joined winning three straight games but after that they only picked up a single victory and drew too many matches especially having led. Without topscorer Eduardo Echeverría, now in Ecuador, they really are set to struggle although picking up Iriberri from Independiente could help. This entry was posted in Clausura 2012, Previews and tagged Clausura 2012, Clausura Preview, Paraguay Clausura, Paraguay football transfers, Transfers Paraguay. Bookmark the permalink.